Iraq faces a growing water emergency. Frequent water shortages, due to chronic mismanagement, have intensified into a complex crisis. Daesh is using Iraq’s water supply to pressure local communities. It has taken control of the water infrastructure in several locations and is using war tactics, including flooding and cutting off water, in order to manipulate the population and impose Daesh’s agenda. The international community is also responsible for significant threats to Iraq’s water infrastructure, as the international coalition has bombed extensively in the vicinity of Mosul Dam and other facilities, which could lead to their failure. Iraqi citizens live with the simultaneous fear of a water shortage and flooding. The Save the Tigris and Iraqi Marshes Campaign has been working since 2012 to protect the quantity and quality of water in Iraq’s great river and to safeguard sites of cultural heritage along the river. Daesh’s recent targeting of Nimrud and Hatra, (the latter a World Heritage Site) make better protection of Iraq’s cultural heritage sites most urgent. We believe that the preservation of cultural and natural heritage should go hand in hand. In addition to protecting its great archaeological sites, Iraq must ensure that sufficient water reaches the Iraqi Marshes to safeguard the environmental health and local livelihood of what was once the largest wetland ecosystem in the Middle East. Now, when on-going conflict threatens to further reduce water flowing to the Marshes, every effort must be made to protect this natural and cultural wonder. Iraq’s water supply faces critical challenges from yet another direction: Turkey’s on-going construction of the Southeast Anatolia Project [known as the GAP in Turkey] with its controversial Ilisu Dam. Turkey has taken advantage conflict in Iraq to start construction of this dam on the Tigris River without first reaching agreements with Iraq that are required under international law. 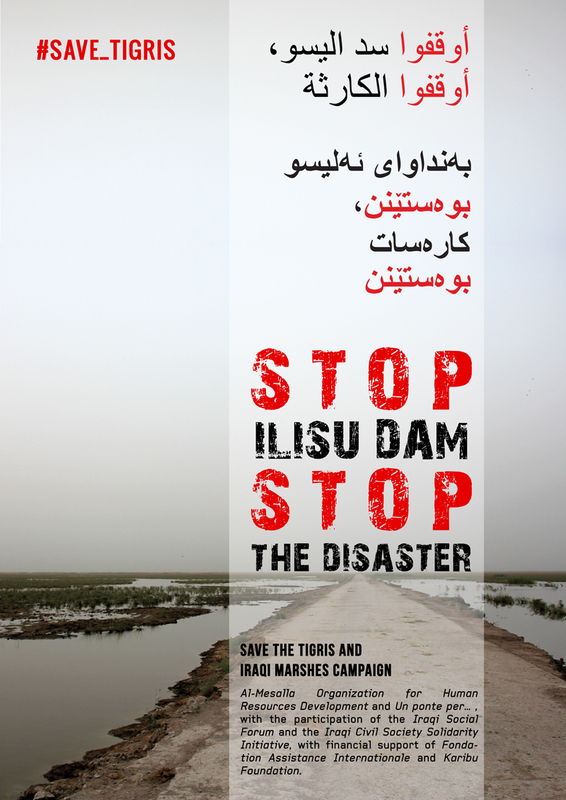 Therefore, the Save the Tigris Campaign has sought to halt construction of the Ilisu Dam. Recently, talks between Ankara and Baghdad were restarted and Baghdad has demanded greater water shares. However, Baghdad’s demands have only narrowly focused on water shares and not on water rights in an international law framework. We see this as highly problematic, as it addresses only water needs, and not Iraq’s water rights, including the obligation of upstream nations to consult with their downstream neighbors prior to the construction of any water infrastructure projects. This could give Turkey the impression that Iraq does not care about water infrastructure built upstream, despite the huge impact it has on all Iraqis living below the dam. Recently the Save the Tigris Campaign expanded our priorities to include the wider goal of protecting Iraq’s entire water infrastructure and ensuring access to water for all Iraqis. The campaign opposes any deliberate manipulation of water resources as a means to control actions or outcomes during armed conflict. Access to water is a fundamental human right, and water should never be used as a weapon. Using water to control populations in the midst of conflict is a direct violation of International Humanitarian Law. Iraqi citizens and civil society organizations are seeking transparency in the flow of information about the negotiations on the part of the Iraqi government concerning water issues. The Iraqi government has an obligation under international law to protect their citizens’ right to water and this obligation and whatever the current crisis, this obligation remains. The Ilisu Dam and the wider GAP Project together with dams being implemented in Iran is a threat to the right to water and we will urge Iraq to act to protect access to water and prevent water being used as a weapon of war. The Iraqi government should carefully analyze the language of any agreements with its neighboring states and ensure they adhere to the principles of international water law. Under existing treaties and customary international law, Iraq has the right to seek mediation to the United Nations Security Council on the sharing of transboundary rivers with Turkey. We know that Egypt has used similar clauses to take Etiopia to the UN and reportedly resulting in an invigoration of negotiations at the highest intergovernmental level. We believe that Iraq should avail itself of its rights and existing treaties to break any deadlock in negotiations and ensure that a just and fair agreement can be reached with Turkey. Within Iraq and the Kurdistan Region there is a need to ensure that planned developments on rivers are not a source of conflicts between regions and communities within the Iraq. Agree and commit never to use water infrastructure (such as dams and desalination stations) as tools of political pressure or weapons of war in any local, regional or international conflict. Adopt the principle: “Water is a tool for building a sustainable peace in the region”. Involve Iraqi and international civil society as true partners in addressing the water, environmental, and cultural heritage issues on the Tigris River. Start discussions with a view to establishing an independent commission involving academic, civil society, government officials and international bodies to assess the sustainable use of water in the Tigris and Euphrates basin. Invoke its rights under existing treaties and customary international law with Turkey to seek mediation through the United Nations Security Council on the impacts of the Ilisu Dam and other planned dams on downstream water flows. Efforts should also be intensified to reach a settlement with Iran on the use of shared tributaries of the Tigris. Make public its intention to ensure that the future use of the water of the Tigris/Euphrates basin accords with international law and with international standards. In particular, we look to the Government of Iraq to ensure that any future developments within the basin are conditional on binding consultation and dialogue with all affected parties with the explicit aim of protecting the rights of people to water and preventing further destruction of the natural or cultural heritage of the rivers. Seek a halt to the construction and filling of dams on the Tigris and Euphrates River and tributaries, particularly the Ilisu Dam, pending the successful conclusion of high level dialogue and discussion with the Iraqi government about the potential downstream social, cultural and environmental impacts of these dams. Of particularly vital cultural importance are the ancient city of Hasankeyf in Turkey and the Iraqi Marshes, both of which are candidates to be included in the list of UNESCO World Heritage Sites. Promote efforts to ensure that Turkey, Syria, Iraq and Iran sign basin wide agreements that meet international law and ensure the right to water for current and future generations living on the Tigris and Euphrates basin and emphasize preservation not only of the quantity but also the quality of water and the ecosystem in the basin’s rivers. Inform Iraqi citizens about government actions and efforts concerning the protection of the nation’s water resources.